The Supreme Court which had given its consent to hear the Centre's petition against the Tamil Nadu government's decision to release all seven men convicted in the Rajiv Gandhi assassination case who are also convicted under the Arms Act and Explosive Substances Act, has restrained Tamil Nadu government from releasing Rajiv Gandhi's killers from the prison and has directed the state government to maintain status quo. As per reports, the contention of the Centre was that the power to remit the three people whose sentences was death sentences were commuted to life sentences rested with the Centre and not the state government. It had further argued that while making its decision to release the convicts, the state government did not follow procedure. The Tamil Nadu government, the IG and two of the men have been sent notices, asking them to reply to the Centre within the next two weeks. The matter will be taken up for discussion again on 6 March. Solicitor General Mohan Parasaran who appeared before a bench headed by Chief Justice P Sathasivam, pleaded for a stay saying the state government should not be allowed to release the prisoners till the apex court decided its review petition challenging commutation of death sentence of three condemned prisoners to life imprisonment on ground of delay in deciding mercy petitions. After a brief hearing, the bench agreed to hear the case at length and posted it at 12.40 PM. Attorney General GE Vahanvati had moved the Supreme Court asking for a stay and the Supreme Court agreed to give an urgent hearing and decided to take up the case later in the day. The Centre is expected to tell the Chief Justice of India P Sathasivam that since Rajiv Gandhi's assassination was probed by a central agency, CBI, under a central law, the Terrorist and Disruptive Activities Act or TADA, Tamil Nadu has to take the decision in agreement with the central government. Under the existing legal framework, the state cabinet can decide to exercise the power of remission vested in it under Section 432 of the Criminal Procedure Code. The state government is however bound to consult the Centre, if, the conviction is made following prosecution by a central agency and under a central Act. According to sources, the Centre may also seek a review of the Supreme Court verdict of commuting the death sentence of the killers to life imprisonment. The Tamil Nadu government’s decision to release the killers of Rajiv Gandhi has been criticized by Prime MinisterManmohan Singh, who called the proposed course of action to release the killers of former Prime Minister Rajiv Gandhi as legally unacceptableand said it should not be proceeded with. He stated that a review petition is being moved by the government in the Supreme Court on fundamental issues of law arising from the assassination of Rajiv Gandhi. The Tamil Nadu government has set a three-day deadline for itself and also to the Centre over the release of the seven convicts. An announcement to release the seven, both Indians and Sri Lankans, convicted in the assassination of the former prime minister was made by Tamil Nadu Chief Minister J Jayalalithaa, in an emergency meeting of the State Cabinet chaired by Jayalalithaa, wherein a decision was taken to free all seven convicts, including Nalini and Perarivalan. 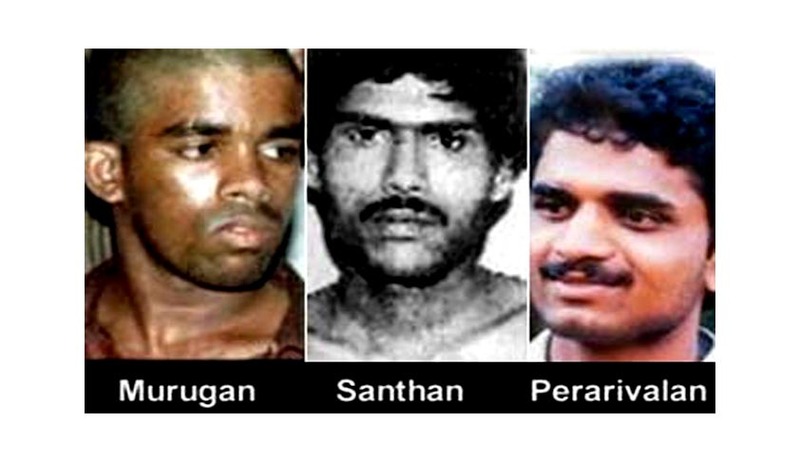 As per Live Law reports, the Supreme Court granted relief to the three convicts in the Rajiv Gandhi assassination case, Murugan, Santhan and Perarivalan, by commuting their death sentence into life term on the grounds that the 11-year delay in deciding their mercy petition by the Central government had a dehumanizing effect on them. According to the apex court bench headed by Chief Justice P. Sathasivam, the delay was not only excessive but also irrational and unexplained. The court while delivering its verdict stated that the life imprisonment would mean life in jail till end. The three-judge Bench rejected the Union’s contentions that the three convicts did not deserve any mercy as they never showed repentance for the killing of the former Prime Minister and they enjoyed their prison life.